What's it like to report in a foreign country? Build your portfolio of work and expand your digital storytelling skills all while immersed in Italian life and culture. In the summer of 2018, I'll be teaching a four-week multimedia journalism course in Urbino, Italy. The program is part of the Institute for Education in International Media (ieiMedia), which focuses on study abroad opportunities for communications students. The course is open to journalism and non-journalism majors. Working with a team of award-winning journalists, you'll get a taste of being a foreign correspondent. A Pulitzer Prize-winning journalist and former White House photographer are among the faculty who teach as part of the Urbino program. Students will study photography, international reporting, and video, and will produce a website about the people, places, and culture of the region. Students live at the University of Urbino and collaborate with Urbino students who serve as interpreters in the field. ABOUT URBINO: Urbino is a picturesque Renaissance hill town and the jewel of the Marche region of central Italy. Although Urbino was a Roman and medieval city, its peak came during the 15th century when Duke Federico da Montefeltro established one of Europe’s most illustrious courts. Urbino’s historic center is a UNESCO World Heritage Site. Urbino is relatively small and off the beaten path of tourists, yet it’s a hip college town with one of the oldest universities in Italy. 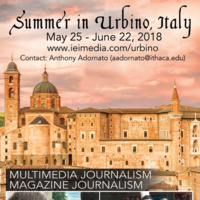 *Ithaca College has no responsibility for the Multimedia Journalism Summer Study Abroad course in Urbino, Italy, offered through the Institute for Education in International Media (ieiMedia) and publicized by Ithaca College Assistant Professor Anthony Adornato. This trip is being planned, directed and sponsored solely by ieiMedia and is NOT a College sponsored, sanctioned or approved program. Professor Adornato is publicizing this trip based upon his participation as an instructor in the ieiMedia program and not in his role as assistant professor at Ithaca College. Individuals who would like to request accessibility accommodations should contact aadornato@ithaca.edu. We ask that requests be made as soon as possible to ensure they can be met.